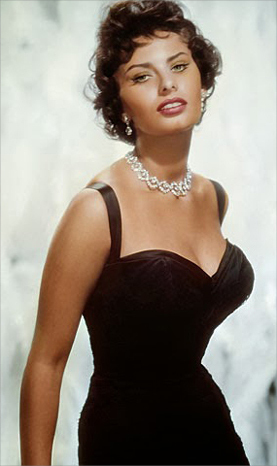 The world has enjoyed a cinematic love affair with Sophia Loren for over 60 years. As a screen icon, she has an uncanny ability to embody a fervor and naturalness that have left audiences breathless the world over in anticipation of her next leading role. It's clear Loren remains an iconoclast of the motion picture community in her limitless ability to transform herself to embody whatever the story calls for in her acting talents. This transformation is arguably most notable in her groundbreaking Best Actress Oscar® role in TWO WOMEN (1960); making her the first performer ever to win that award for a foreign-language film. Beloved the world over as cinema's premier leading lady, Loren's career has spanned many genres in which she's starred alongside some of film's most prominent leading men who framed her star power in a similar magnitude. 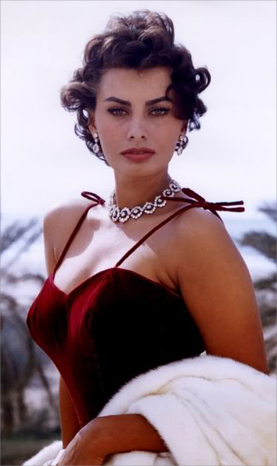 Her co-stars have included Marlon Brando (A COUNTESS FROM HONG KONG), Clark Gable (IT STARTED IN NAPLES), Cary Grant (HOUSEBOAT), Charlton Heston (EL CID), Marcello Mastroianni (YESTERDAY, TODAY AND TOMORROW), Paul Newman (LADY L), Gregory Peck (ARABESQUE), Anthony Perkins (DESIRE UNDER THE ELMS), Peter Sellers (THE MILLIONAIRESS) and John Wayne (LEGEND OF THE LOST). 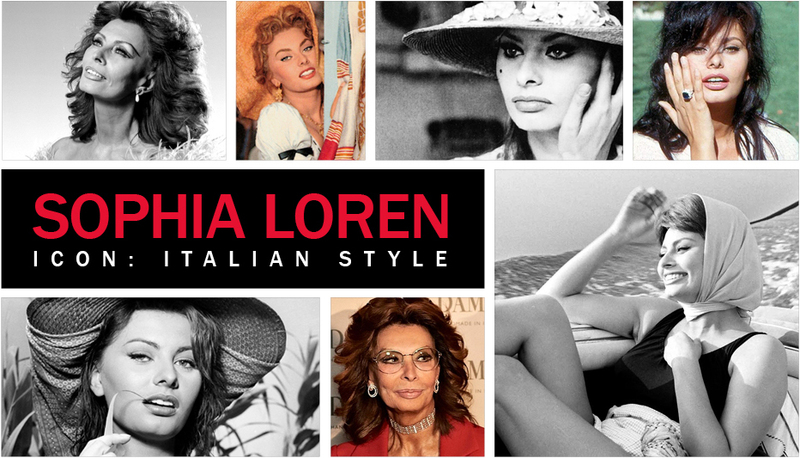 In her memoir, “Yesterday, Today, Tomorrow: My Life” (Atria Books, December 2, 2014) Loren recounts tales of the aforementioned leading men alongside the personal life struggles that shaped her in the hearts and minds of Italians and Americans alike as a universally appealing leading lady. Today, Loren remains philosophical and candid in her approach to her life and acting career. Originally from the war-torn town of Pozzuoli, Italy on the Bay of Naples, her secret to survival is in the power of positive thinking. She remains intensely devoted to the concept of being present in the moment. 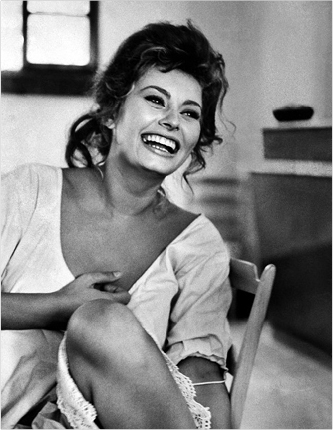 We celebrate her illustrious career at this year's AFI FEST 2014 presented by Audi which takes place in the heart of Hollywood from November 6–13, 2014, screening the newly remastered 50th anniversary edition of MARRIAGE ITALIAN STYLE (MATRIMONIO ALL'ITALIANA, 1964). Loren spoke to us candidly in her unmistakable Italian accent from her home in Geneva, Switzerland. She talked to us about life, family and celebrating MARRIAGE ITALIAN STYLE. We’re celebrating the 50th anniversary of MARRIAGE ITALIAN STYLE at AFI FEST. What stands out about your Academy Award®-nominated performance? It’s a question for an actress about having a good story to play with. A story that fits with you as a person and that little treasure that you carry within. A story that you like so much because it’s very close to what moves you as a human being. The film is a story about a woman with children and the person she lives with who treats her like a nobody. It is great to have wonderful material to work with. And so, when you like it, and you fall in love with it, you really put yourself so much inside. Things come through in a good way, real and moving. Stories like this are very rare to find. You won the Academy Award® with Vittorio De Sica's film TWO WOMEN. As a director, how did Vittorio De Sica influence your performance in MARRIAGE ITALIAN STYLE? Well, you know we came from the same town [Naples] and we thought in the same way. The gestures were the same and it was something that I knew already and he was able to pull out the performance from me. You know, it’s like when you meet the right person and you say to yourself, “Well I’m going to spend all my life with this person; I know it, I can feel it.” And De Sica, for me in acting, was that kind of a person. Because we had the same kind of reactions, and I appreciated him, and he liked the things I was doing. It was a really wonderful, strange marriage. You made 14 films with your MARRIAGE ITALIAN STYLE co-star Marcello Mastroianni. What was that relationship like? Beautiful. That’s another thing that’s actually unique. Marcello had already been on the stage for 10 years when we first met. And then he started to make films, and there was this story that was called TOO BAD SHE’S BAD, a comedy, and from the time we started the film and when the film came out it was a big success. So, we started to do many comedies together. But not only in that kind of vehicle. Our acting styles merged with MARRIAGE ITALIAN STYLE and other films that were sometimes a comedy but also with drama in them. But of course, MARRIAGE ITALIAN STYLE was a big dramatic story that was written by a great writer called Eduardo De Filippo for the theater for his sister. And it’s a great vehicle, and it has been done many times for the theater and in the movies. But I think what Marcello and I did together with the direction of De Sica is quite something. And even now, when I see it — I mean I saw the film in Cannes, and it’s really like a film you can see today — it’s something, it’s a miracle. VOCE UMANA (HUMAN VOICE), directed by your son, Edoardo Ponti, is also showcasing at AFI FEST. What was it like being directed by your son? Strange, because I always treated him as my child, and when we were on the set, I had to think of myself as an actress working for a director. I think everything went really beautifully, and the story involves us so much that everything was great for the moment. Everything that we were doing, we liked, and it was really an enormous psychological story for me, because this was a story that I always wanted to do, but of course to be able to do a story like this I had to be much older. So, when I reached the age that I could, I tried, and we succeeded. It’s like an examination; it’s like going to school with notes about what you have always wanted to do in your life and passing. I’m happy I did it. And the results were very good. You’ve been working at the craft of acting for six decades. You’ve said previously, “The story counts into the career of an actor.” What are your thoughts about the mechanics of acting at this stage in your career? Is it innate talent, or is it something learned? Well, I’m a little reticent to say that I never learned acting. But it doesn’t mean that when you say “learning” you have to learn with books and things, because you can also learn by living life. By being in so many kinds of situations and trying to overcome them. So all these things that you swallow inside of yourself are very important for you. One day, when you see the story that you like, everything has to be able to come out. I really learned the hard way, because during the war I saw so many things. You know, these kinds of things you will never forget. The gestures, the voices, the tragedies. So you carry all of these things inside of you and through your blood, through the milk of your mother, when you are nursed, when you are a baby, it stays with you all your life. Also, I had the luck to be able to be directed by a great director like Vittorio De Sica — I worked with him for 20 years of my life. I mean, we did 14 films together with Marcello Mastroianni. So, this is also kind of learning. Of course, you have to be ready to receive what is given to you, because you really want to do what you are doing and you want to do it well. In 1963, you presented AFI Chair Emeritus Gregory Peck with an Oscar® for TO KILL A MOCKINGBIRD. In return, he presented you with your Honorary Oscar® in 1991. What was that moment like for you? Coming full-circle and being present to accept the award, when you were in Italy during your first win in 1962? Well, I didn’t go to accept the award, because for me to have been nominated among the five was a great honor. It was the first time that they gave a nomination to a film that was spoken in Italian. So, I said, “Well if I am among the five I’m very happy.” But then when you are among the five, you hope that you’re going to win [laughing], because you’re never satisfied. But I stayed in Italy because I said, if I win, which I don’t think I can, but if I should win, I’m going to faint. So it’s better if I faint at home and not on the stage. So I didn’t go. But, the night of the Oscars®, we mistook the time change — Italy/America, you know. So, at six o’clock in the morning, my husband Carlo said to me, “Well, I think that we're happy to be among the five, but let’s go to bed.” While we were going into the room, the telephone rang, and it was Cary [Grant] on the phone. So he says, “Sophia, you won; Sophia, you won! You won! Aren’t you happy, aren’t you happy?” "Of course I am happy" [laughs]. It was really, I mean, really beautiful. You know, to win an Oscar®, it’s so overwhelming, with all the emotions, and you are full of hope afterwards, full of energy, confused. It’s a big thing; it’s really a great moment. You presented the Oscar® to Roberto Benigni in 1999. Who do you see as important or influential filmmakers in Italian cinema? Benigni’s a genius. We can’t have many geniuses like Benigni. You just give a word to him and he does a wonderful performance. When I said his name on the stage, he started to walk over the heads of the most incredible producers, actors, all of the greatest cinema players in the world. What a performance. He was so happy. He was great. He invents so many images, and it’s poetry. We have only one Benigni in the world. You are the last living female star on AFI’s list of greatest American screen legends. What’s your secret? What’s my secret? I have no secret. I am what I am. I mean, the reactions and how I live and how I feel, it’s very spontaneous. I like what I did. I like what I do. I always choose what I think makes me better. I want to learn all the time. Because you know in life I’ve had so many, not in life, when I was a child, I’ll say that it was very hard for me to cope with my mother for the absence of my father. I always wanted to have a family. I know it sounds like a story that many, many women have, but for me it was really a disaster. And then I found myself in between the war and hunger and it was really violent; it was really violent. But I was very little; you know, it’s incredible. And from that, I really started to say to myself, “Sophia, I think you should change your thinking.” I think you should think that life can be better than what you live now. And I think if you make a little effort, and you really think that everything is going to come to you — just believing in yourself, just believing in you — then little by little, I started to believe in this positive thinking and it was a big lesson for me, and it still is. I mean I never stopped learning, I’m still learning. So, I say to myself always, “Well, it’s time to wake up and see what you are going to do when you really start living.” And being over 80, you know it’s still like this. Fortunately for me, it worked in the past and it still does. It gets better. It gets better if you want to. I don’t know where I will go from now on, but it’s beautiful. Do you have a dream project or director you would like to work with? I dream, I dream. But of course. I mean, I dream things, but until I start to realize these dreams, I don’t want to talk about it because otherwise I would be very upset, you know. And I don’t want to be upset for what I can do. Because I know that I still have a lot of energy. I adore my life. I adore my family. I adore my children. I adore my grandchildren, my friends. I am a good person. I am a really good person. Maybe it sounds a little bit ironic, but there’s everything in there. In a way, I’m going to get very emotional because that’s the way I am. What do you consider to be your greatest role, or greatest achievement in cinema? Let’s say two or three films. Like TWO WOMEN, A SPECIAL DAY and the film, because of that encounter with Charlie Chaplin (A COUNTESS FROM HONG KONG). What an honor for me to be directed by a man who invented cinema. It was a great emotional moment for me. What was the crossover like from Italian cinema to Hollywood? I like my business, I like the people who are involved with it, and I really love them. Because it’s a very difficult profession, you know. You are in front of everybody, and they always say things and you are always judged, and sometimes they don’t even know how much you have to pay for what you give on the screen. So then, when you find yourself in a theater to see the film that you’ve done, and people enjoy it, what a moment. What a moment! It’s glorious. Glorious. I really love my business.